Click and Make-Up Beauty Blog: MAC Venomous Villains Coming Autumn 2010! 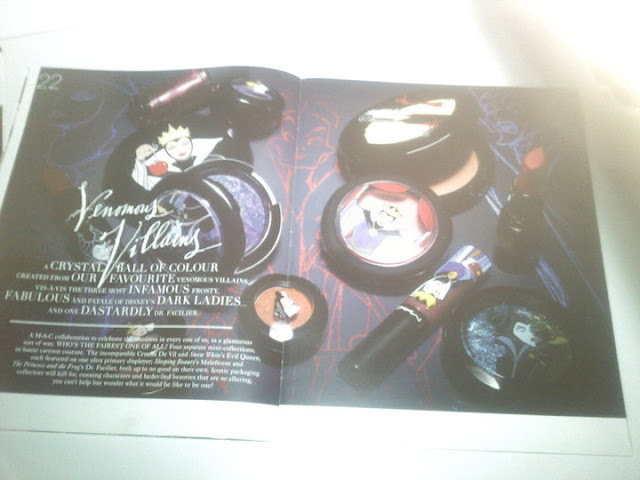 Rumours about a MAC Disney collection have been swirling on Makeup Alley for ages now, and this afternoon I was delighted to read Princesa Livia's post about the forthcoming MAC Venomous Villains collection due out in Autumn 2010. Now I must say I am a little disappointed that MAC has based the collection on their villainous characters, I would have preferred so see my beloved Disney Princesses (Ariel, Aurora, Belle, Jasmine!) adorning the packaging, but no doubt I will pick a few bits up from this collection. Instead we get to choose from Cruella, Ursula (the one I'll go for as I love The Little Mermaid! ), the Evil Queen, Dr. Facilier and Maleficent. I'm slightly surprised that MAC just went with the straight up cartoon illustrations in all their glorious colour rather than working the characters into a more sophisticated design, but hey, we're all kids at heart! I deeply regret missing the Hello Kitty collection (I must have been on Mars at the time) and so I will be swooping into MAC Westfield the minute they're released! Will you bother with this collection? Did MAC go with the best Disney villains?! Literally, when I saw first saw the pics for this it was like... sexual. Malificent is the best Disney villian. Whether I like the products is a different matter, but even if I don't I'll probably get a couple of things and depot other stuff into them O_o I'd like to see the princesses as well but I think it might be a bit kiddy maybe? I think that this is SOOOO exciting!! I havent seen any offical information on this but WOW! I would love to see some pretty purples. Oh my gosh im so excited for this! @Robyn - I have to say Ursula is my favourite - Little Mermaid Love! That's a good idea about depotting good stuff into the cases if the insides aren't up to much. Princesses probably would be a bit kiddy but they could have maybe kept the black packaging and just recreated the images with silve/gold/one colour rather than the actual cartoon images - Maybe Disney wouldn't allow it. @DreamingCrush41 - yes I'd love to see some pretty purples as MAC doesn't really do it for me on the purple front. Inglot is much better for them! Exciting! I love MAC!! I'm totally a MAC girl.